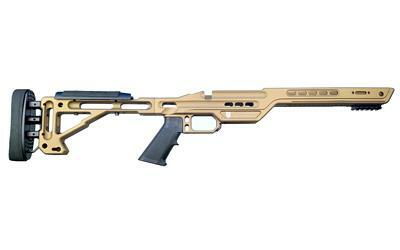 The MPA BA Lite will provide shooters who desire a lightweight rifle stock/chassis a feature rich design that will serve both hunting applications and long range shooting competitions where weight considerations come into play. You have the ability to adjust the length of pull, cheek riser position, add side picatinny rails or a night vision bridge, and also increase the distance from the spigot mounted bipod to the rear support. A BA monopod system can also be added along with buttstock mounted bag rider attachment.